File under “to good to be true”. 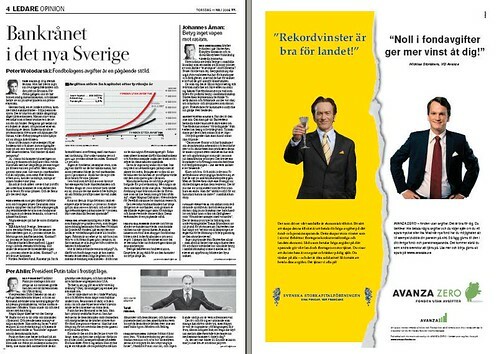 Dagens Nyheter’s columnist Peter Wolodarski today writes a piece about Swedish banks and their fees for managing funds. He calls it “bank robbery” and that the fees are a “continuing theft”. On the opposite side in the paper is Avanza’s much discussed advertising campaign for its new fund savings offer where customers can invest in funds without any charges whatsoever. Is this what is called integrated communication? Tags: Public Relations, PR, advertising.